King County Metro’s Access paratransit service takes around 3,000 trips a day. 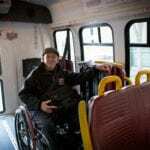 It carries passengers who would otherwise be unable to ride public transit due to a disability. But some who ride paratransit believe that it could be improved and feel now is the time for change. Produced by Rachel Stevens.